The New Weibull Handbook, 5th Ed. Copyright © 2004 by Robert B. Abernethy. Published and Distributed by Robert B. Abernethy, Ph.D.
Click here to view the preface and the table of contents. Click here to view the first chapter. This handbook will provide an understanding of life data analysis. Weibull and Log Normal analysis will be emphasized particularly for failure analysis. There are new applications of this technology in medical and dental implants, warranty analysis, life cycle cost, materials properties and production process control. Related quantitative models such as the binomial, Poisson, Kaplan-Meier, Gumbel extreme value and the Crow-AMSAA are included. The author intends that a novice engineer can perform Weibull analysis after studying this document. A secondary objective is to show the application of personal computers to replace the laborious hand calculations and manual plotting required in the past. The New Weibull Handbook has become the national and international standard for Weibull analysis. It is in daily use throughout the world. Thousands of copies have been distributed. Users include military, automotive, medical, electronic, materials & composites research, aerospace, electrical power, nuclear power, dental research, advertising, bearings, compressors, v-belts, chain drives and on and on. 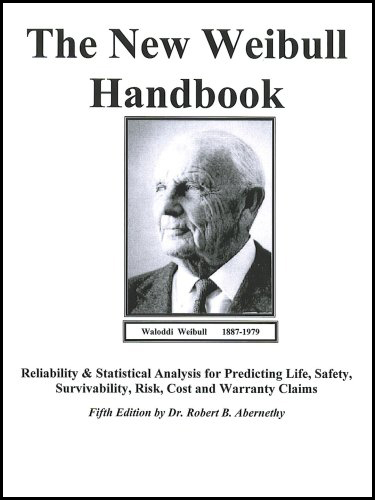 Many organizations have adopted the Handbook and software implementing its methods as standard including the Federal Aviation Administration, Harley Davidson, Motorola, TVA, Honeywell, BICC Genereal, GKN Automotive, Dupont, Meritor Automotive, Teleflex, Guidant Cardiac Pacemaker (CPI), Daimler Chrysler, General Electric, Siemens, Behr, Borg-Warner, NASA, Rolls Royce, Gates Rubber, the US Naval Air Arm (NAVAIR), the US Air Force at SAALC and WPAFB, and Dow Chemical.